Richard Thrale's 1973 book A New Thraliana shows the arms of the Thrale family of the City of St Albans in the County of Hertford, which is the most well researched and is most likely to be authentic. 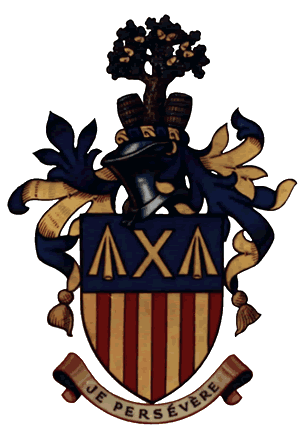 The Blazon comprises a Shield per fess azure and paly of ten or1 and gules, in chief a saltire couped between two pheons points upwards or, and the Crest, between two tuns an oak tree proper, fructed or. The extravagant monument of John Thrale in the South wing of the St. Alban's Cathedral in Hertfordshire, includes a colourful coat of arms at its summit. 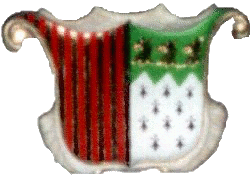 This is the oldest Thrale coat of arms known to me. This comprises a Paly of ten Or and Gules, with the Crest, Out of a Ducal Coronet an oak tree vert2. A similar coat of arms3 was used by John Threele of Arundel; who died in 1465 and was Marshall of the Household to William, Earl of Arundel, and in this case the coat was: Paly of ten, Or and Gules. Hello, well I was certainly surprised to find this site. I have been interested in tracing the heritage but this is the most information I have found in one place. I was curious about the coat of arms, I have seen one, and have it at home, but reading your description I wonder if it is correct. Do you by chance have a picture of our coat of arms?? Well thanks for the time. David also sent me the below image of a commercially produced account of the family name. Interesting. If you are looking for a coat of arms I was able to find one from a company who had set up in a shopping mall and it was under the name Thrall. It should be on the web. John Franklin Thrall, I am writing just to contact you again. I am your nephew Mathew - son of Nancy Jean. It has been many years since I have talked to you but I hope that you are doing well. Just to let you know that the Thrall family has expanded on the Zupan side to 14 grandchildren. I now have two sons and a third child on the way. I hope I get to visit with you next time you come home. Hello, well I was certainly surprised to find this site. I have been interested in tracing the heritage but this is the most information I have found in one place. 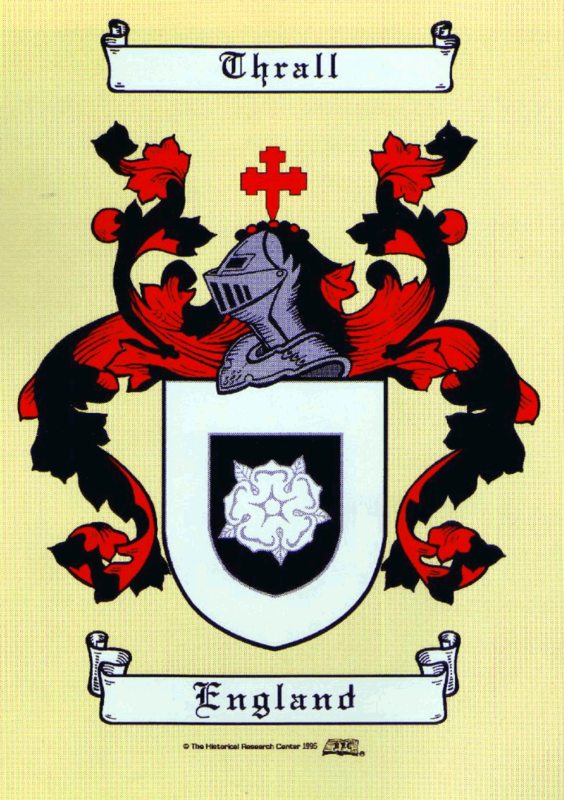 I was curious about the coat of arms, I have seen one, and have it at home, but reading your description I wonder if it is correct. Do you by chance have a picture of our coat of arms?